Marialyn and Tom Boekbinder in their custom-built food truck located on their Kings Lane property. Chicken smoked for hours on the bone, leaving a crispy seasoned skin over melt-in-the-mouth meat. Fresh rice paper spring rolls with rainbow-bright veggies and homemade peanut sauce. Low-carb fried chicken served with golden potato rosti. It all tastes as delicious as it sounds, and it can be found in a garden near you. Dr. Tom’s Cafe opened five weeks ago on Kings Lane, across from the medical clinic and a short walk from Lady Minto Hospital and Braehaven/Greenwoods. The home-based business operated by Tom Boekbinder and his wife Marialyn is a great new option for lunch for people following a ketogenic diet, but also for anyone who enjoys good food. The couple’s custom-built food truck with stainless steel kitchen is the site for food preparation and serving, while Tom’s wood pellet-fed smoker is located outside. Picnic tables, umbrellas and a gravelled courtyard transform the home’s front yard into a prime lunching location just steps off the main road into town. It may be a coincidence that three health-care facilities are located in such close proximity, but it makes sense that the health-minded people working there would be among the first to discover the delicious menu that Tom and Marialyn are cooking up. “The overall objective is to provide simple food items that feed the body in the best way possible, but also taste great,” Tom explains. Tom is a retired veterinarian from California who has loved cooking for family and friends since he was a 10-year-old boy in Holland. Moving to Salt Spring and building a cafe in his front yard fulfills a longtime dream of easy communion with friends and neighbours that’s based around sharing food. The business is a family hobby that’s been created for love rather than profit. “We’re doing the cafe four days a week because we have a daughter, and it has to be fun, too. And I’m doing it with my wife who I love dearly, so nothing can hurt that relationship,” Tom says. Marialyn, his wife of 13 years, brings Filipino cuisine and a love of people to the arrangement, while their 10-year-old daughter is the inspiration for Sophie’s Chocolate Garden. This line features products made from ground cacao nibs and just a few high-quality additions, as well as ketogenic chocolate. Other mouth-watering menu items include smoked Italian sausages, a noodle bowl made with bone broth and spaghetti squash “noodles,” and a recent experiment on baked brie puffs made with a low-carb crust. 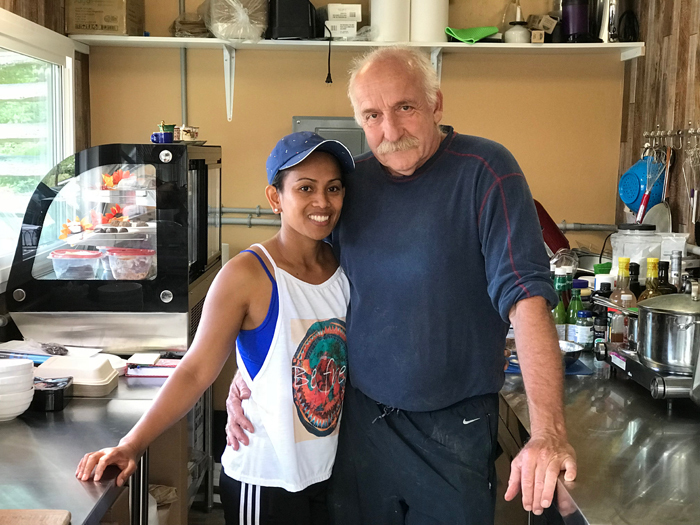 Dr. Tom’s Cafe recently catered a staff lunch for 25 people using only Filipino dishes to great success, and Tom and Marialyn plan to start offering more dishes at the cafe, perhaps on a special day or special week. They use local and organic ingredients whenever possible for all their dishes. The outdoor cafe is open from 11 a.m. to 2 p.m. Monday through Thursday, with plans to stay open year-round. For more information and to see the menu, visit drtomscafe.com.